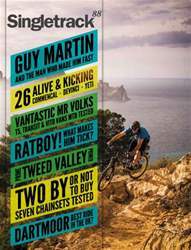 Issue 88 of Singletrack is packed to the rafters with mountain bike goodness to get you ready for spring. We visit the Tweed Valley ahead of the very first UK round of the Enduro World Series, watch Guy Martin and Terrahawk face off over a loaded teapot, we send Chipps to ride from Summit to Sea on another busman’s holiday and get Seb Rogers’ view on trail centres down under. We interview the irrepressible Josh Bryceland, take a spin round Dartmoor, test three – no, four! – brand new 26in bikes from Devinci, Commencal, Yeti and Pinion, get the skinny on three dream adventure vans, and chuck handfuls of product into the Grinder and see what comes out the other side.